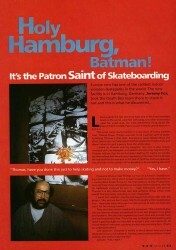 Jeremy Fox wrote the words and Davy Van Laere supplied the photographs for this story about a pioneering indoor wooden skatepark in Hamburg. Leaving aside the fact that they have one of the finest wooden bowls in the world, a perfect vert ramp, two killer minis and a super fun street area, the most astonishing thing about the place is that it’s totally free to skate! It simply cannot be true — but it is. This is not some council facility: it is the vision of a very wealthy man, Thomas Friese. 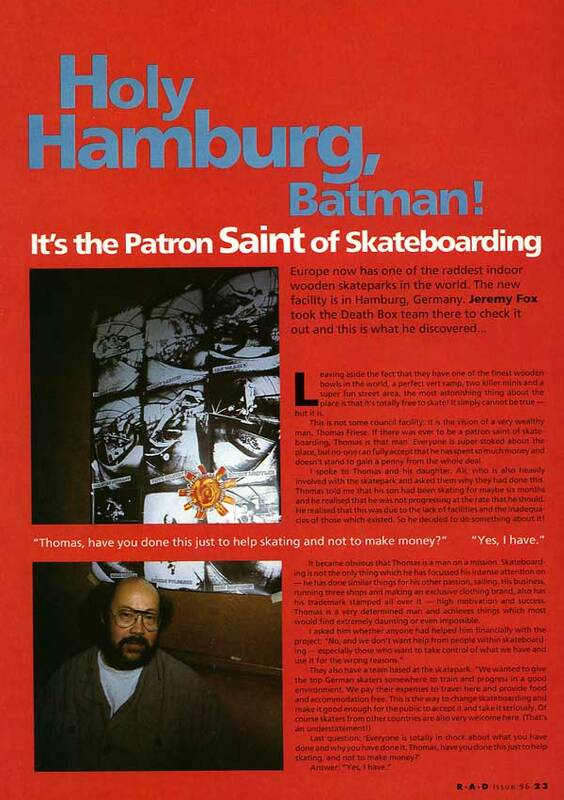 If there was ever to be a patron saint of skateboarding, Thomas is that man. Everyone is super-stoked about the place, but no-one can fully accept that he has spent so much money and doesn’t stand to gain a penny from the whole deal. I spoke to Thomas and his daughter, Ali, who is also heavily involved with the skatepark and asked them why they had done this. Thomas told me that his son had been skating for maybe six months and he realised that he was not progressing at the rate that he should. He realised that this was due to the lack of facilities and the inadequacies of those which existed. So he decided to do something about it! It became obvious that Thomas is a man on a mission. Skateboarding is not the only thing which he has focussed his intense attention on — he has done similar things for his other passion, sailing. His business, running three shops and making an exclusive clothing brand, also has his trademark stamped all over it — high motivation and success. Thomas is a very determined man and achieves things which most would find extremely daunting or even impossible.